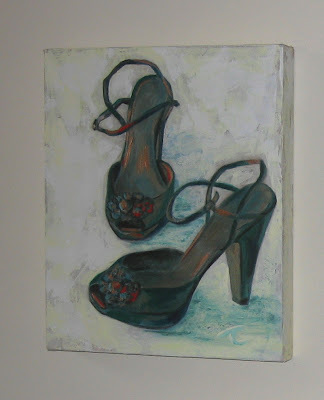 Tina Collins - Art Diary: Still Life - Its a girl thing! Still Life - Its a girl thing! I have just started reading The Art Spirit by Robert Henri - he says for an artist to be interesting to others he must have been interesting to himself. Well call me shallow but my shoes are interesting to me. When I was sorting through them a while ago I was thinking how lovely (and barely worn) some of them are. Although I dont really understand why shoes cause most women to verge on kleptomania there is no denying the Adoration Of The Shoe. So for me a good still life subject, both shallow and meaningful and with a few technical challenges too. There are more to come but sadly no red soled versions exist in my wardrobe. 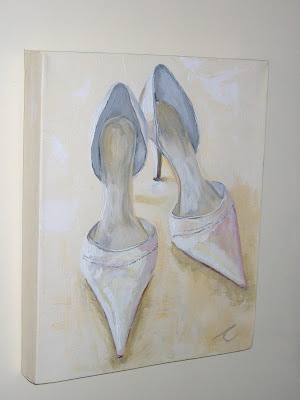 White Shoes - Acrylic on Canvas 10 x 12"
Bronze shoes - Acrylic on Canvas 10 x 12"